After compulsory application for CPU certification by the interested party, the invoice for the 1st part of the certification fee is sent. The invoice amount is payable no later than 14 days after the invoice has been issued and it is a precondition for further action by the DGK. With the submission of the invoice for the certification fee, the application is deemed to have been accepted. After receipt of payment, the DGK commissions FileTeam as a cooperation partner in sending the access data for the online submission of the questionnaire. With this commissioning, the questionnaire that was completed by the applicant is forwarded to the reviewers as a checklist for the audit, and it forms the basis of the audit report. The CPU Certification Board proposes two independent, trained reviewers for the assessment. The selected reviewers are commissioned by the DGK to carry out the assessment. The DGK transmits the data that has been obtained at this point, along with the checklist, to the experts. The assessors then make contact with the applicant and agree on a date for the audit (the inspection). The DGK is informed about the date and issues the invoice for the 2nd partial amount of the certification fee. The reviewers carry out the audit on the agreed date, draw up a report and make a recommendation. Both are forwarded by the reviewers to the DGK. The DGK forwards the report and the recommendation to the CPU Certification Board. On the basis of these documents, the Board decides whether or not the certificate should be granted and informs the DGK of the decision. According to the decision, the DGK issues the certification, sends a notice explaining the reasons of rejection or issues certification subject to reservation, provided that the applicant has not fulfilled all the requirements but is able to do so in the foreseeable future. 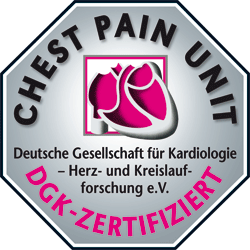 The fee for the certification of a Chest Pain Unit is €5,000 net plus the travel expenses of the consultants, according to the travel expenses directive of the DGK. The initial certification is valid for 3 years, after which re-certification is necessary.